Home >Forums > Religion > When will the Rapture Happen? No Man not even the angles, but God does not deal with the church and Israel at the same time in the end days and that's where the rapture happens. can any one on this forum tell me where this happens in the end time prophecy of the bible! After the thousand year rule of Christ has ended,when the last trumpet sounds and the fire comes down from heaven and incinerates all physical life forms on the earth. The S-word of God. The sharp two edged Tongue, that cuts all the way through to the division of the Soul and the spirit. Whoops, looks like you didn't get the memo, the rapture already occurred, God is gone with his chosen people. Looks like He left you behind. Sorry, about that. ...the last trumpet sounds and the fire comes down from heaven and incinerates all physical life forms on the earth. You'd really like to see that, wouldn't you? Nice. 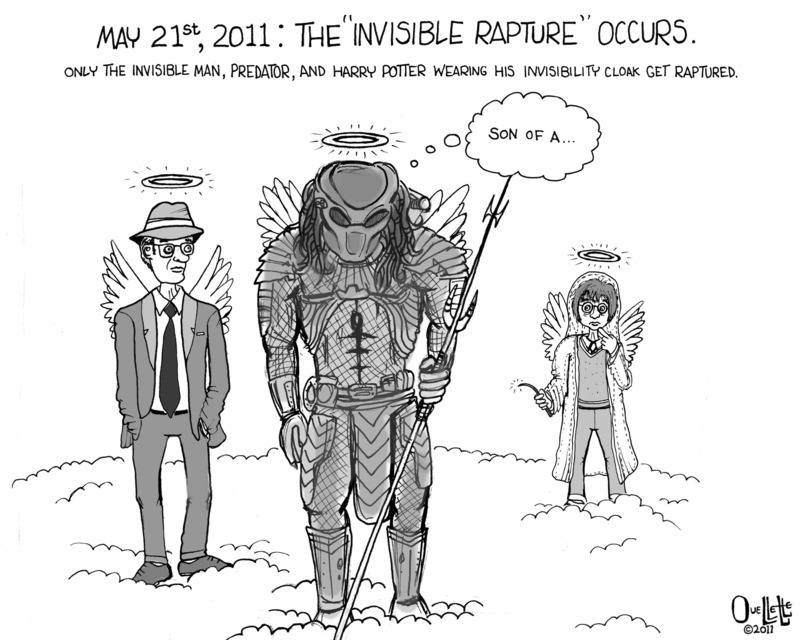 The rapture is a myth. It is a fantasy. It is a fiction. Tim LaHaye has also written a set of 13 NOVELS on the subject. They are all FICTION. Why do so many Christians believe in fiction? The rapture is a myth> No and when we leave is very intro and Jesus God does not deal with the church and Israel at the same time so that's where it happens , give or take. so hot shot where in the bible this happens? Is the State of Israel a Myth? after 2000 years!!!!! I think not>In your face. So Sky Where in the bible prophecy God goes from the church back to dealing with Israel again? Wait till I get through all the bull shhhh that has been hurled at you by the godless atheists who haunt the religious forums and I will answer you. First of all, which end time prophecy are you referring to, as nearly all the prophets, refer to the end time? Secondly, I have already said, that it is after the thousand year rule of Christ has ended, when the last trumpet sounds and the fire comes down from heaven and incinerates all physical life forms on the earth. But when is that? No person on earth knows. For Satan will be let loose first to gather his people to himself and surround the Holy city, which will be empty, and it is then that the total destruction of all physical life forms that remain on the earth will occur, as seen in Zephaniah. Sorry maty, but I am correct, but if you wish to believe contrary to the Holy Scriptures, then that is your prerogative. Come on people is there no one with the HOLY GHOST on this forum and know prophecy of the bible. Like yourself, who believe that you have been filled with the Holy Spirit, Stephen was also said to have been filled with the Holy Spirit, and like you, Stephen did not have a clue as to the truths revealed in the Holy Scripture. Stephen, was a Greek speaking Jew, who had been dragged before the Jewish authorities by Saul, in defence of his faith before being stoned to death, stated in acts 7: 4, that it was after Terah HAD DIED that his son Abraham obeyed God"s command and went to live in the land of Canaan. But the record in Genesis makes it plain that after Terah had turned 70 not 75 or 80, he became the father of Abraham, Nahor and Haran, and that Abraham was 75 when he travelled to Canaan, leaving his father with his younger brother "Nahor," and that his father died 60 years later at the age of 205. Stephen "s word"s here are seen to be untrue. Jacob and his other sons were buried at Mamre and concerning the buriel of Jacob, it is written in genesis 50: 13, "They carried the body of Jacob to Canaan and buried it in the cave at Machpelah east of Mamre in the field which Abraham had bought from Ephron the Hittite." Again Stephen"s words are untrue. But I see no one understands what that means! The State of Israel after 2000 years> was no mistake! until the times of the Gentiles be fulfilled >>>> what that all about? Still waiting where that line is crossed! The rapture of the church and God to deal with Israel. The verse you quote is not in reference to the end when fire incinerates the surface of this planet, but to the war that ends all wars, the great tribulation, that comes before the Lord establishes his thousand year rule on earth. Here are a few more prophecies referring to the time of tribulation. The war to end all wars, is not between God and Satan, but between the God of Abraham, Isaac and Jacob, and the Nations of the world, who would drive Israel into the sea and into oblivion, if not for His intervention. Concerning that war to end all wars; which is to be the salvation of the Nation of Israel in the great tribulation, when the Holy City will be surrounded by those nations who would attempt to drive God's chosen people into the sea. "Multitudes, multitudes in the valley of decision. The sun and moon shall be darkened and the stars shall withdraw their shining. The Lord also shall roar out of Zion, and utter his voice from Jerusalem, and the heavens and earth shall shake, but the Lord will be the hope of his people, and the strength of the children of Israel. "A King like a bright star, will arise in that Nation. Like a comet he will come from Israel. He will strike the leaders of Moab and beat down all the people of Seth. He will conquer his enemies in Edom and make their land his possession. While Israel continues victorious. The Nation of Israel will trample them down and wipe out the last survivors. They shall look upon me, and see the one they have pierced, and they shall mourn for him as one mourns for an only child. "Who is this coming from Bozrah in Edom? Who is this so splendidly dressed in red, marching along in power and strength?" It is the Lord powerful to save, coming to announce his victory. "Why is his clothing so red, like that of a man who tramples grapes to make wine?" The Lord answers, "I have trampled the Nations like grapes and no one came to help me. I trampled them in my anger, and their blood has stained all my clothing. I decided that the time to save my people had come; it was time to punish their enemies. I was amazed when I looked and saw that there was no one to help me. But my anger made me strong, and I won the victory myself. In my anger I trampled whole Nations and shattered them. I poured out their life"s blood on the earth." Zechariah speaks of the day in which the Lord will save his people. Chapter 14: "The Lord will come to fight for his people as he has fought in times past. He will fight the enemies of Israel; those Nation who surround Jerusalem in their attempt to drive God"s chosen people into the sea. The Lord will throw them into a state of confusion, and the weapons of destruction, with which they would destroy Israel, He will cause them to turn upon their own allies, and they will suffer a terrible disease, the soft tissue, such as their eyes and tongues will melt in their sockets, and their radiated flesh, "cooked to the bone," will slide from their bodies while they are still standing. Then all the surviving Nations, will send their representatives each year to Jerusalem in the land of Israel, to worship, and pay tribute to the Lord, who will rule the whole world with a rod of iron and woe betide those who refuse to do so. Then all the godless people of the world, and all those, who, in their cathedrals of stone, Marble, and crystal, who sing and dance with their eyes and hands raised to the heavens in worship of a god they neither know or understand, will bow down and worship the God of the Bible. MALACHI 3: 1-2; The Lord Almighty says, "I will send my messenger to prepare the way for me. Then the Lord you are looking for will suddenly come to his Temple. The messenger you long to see will come and proclaim my covenant." But who will be able to endure the day when he comes? Who will be able to survive when he appears? Acts 17: 31; For he has fixed a day, (the Great Sabbath, (The Day of the Lord) (The seventh period of one thousand years from Adam) in which He "Our Lord God and Saviour" will judge the whole world with justice by means of a MAN he has CHOSEN. He has given proof of this to everyone by raising that MAN from death. For one thousand years are to the Lord as one day. "He is the Lord of the Sabbath." The day of the Lord is the Sabbath or the seventh period of one thousand years, from the day, in which Adam ate of the forbidden fruit and died in that day at the age of 930. From the Book of Jubilees 4: 30; "And He (Adam) lacked seventy years of one thousand years; for one thousand years are as one day in the testimony of the heavens and therefore was it written concerning the tree of knowledge: "On the day thou eat thereof ye shall die." For this reason Adam did not complete the years of that first day; for He died during it." Well, I'm off to town for the day, catch you all later. Gen > nice but NO! Ok lets start, All blessing of the world will come from the jews and Israel that's what the bible states, its in the bible look it up. the bibles state there will be scales on the eyes of Israel till the fullness of the gentiles come in. Its in your bible >read it an problems so far.